Talk about a ‘power’ desk. This 1970s bureau by Serge Manzon in the upcoming 20th Century Design sale at Sothby’s Paris is substantial and seductive! The soft warmth of the dark brown lacquer together with the glowing warmth and strength of the brass is a luxurious combination. The U shaped legs add grace. Manzon (French, d. 1998) was originally known as a fashion designer in the 1960s who drew inspiration from abstract artists such as Brancusi and Arp to create sculptural pieces. 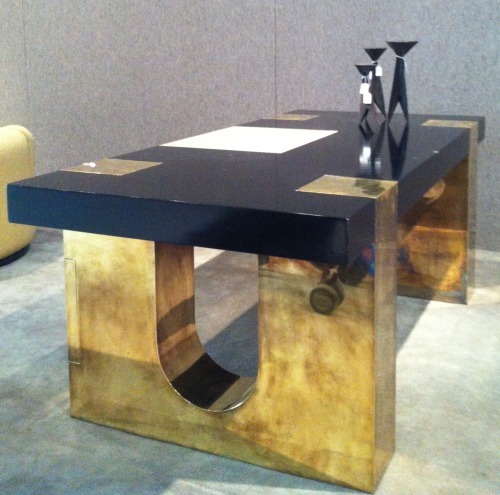 He began designing furniture in 1971 with a series of black and white lacquered tables incrusted with steel and chrome. These ‘perfectly constructed gems’, as they were referred to by the critic Xavier Gilles, had great success. He went on to open a gallery and in 1976 the Mobilier National invited the talented young artist to contribute to their collection of contemporary furniture. Pierre Cardin was also impressed and exhibited Manzon’s designs in his gallery l’Evolution at 118 Faubourg Saint Honoré.